I’ve been here in the Seattle area since Saturday afternoon, to attend this year’s Global Summit for Microsoft MVPs. As a recently-awarded Windows Insider MVP for 2018, it’s my pleasure and privilege to hang with a truly stellar group of technophiles and ubernerds, each of whom specializes in one or more Windows platforms and technologies. We’re here to learn more about where the colossus of Redmond is heading, and to provide feedback about the company’s many products, services, and programs. I’m not allowed to talk details about technical stuff because of a draconian but entirely understandable NDA to which I had to agree so I could attend this shindig. Talk about a wake-up call! 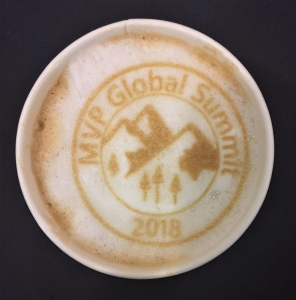 Microsoft says it in cappuccino foam this morning. Even so, there’s a lot to talk about anyway. I’ve learned that the real impetus of the Insider program is to obtain feedback from the 2M+ members of that program. Indeed, user input through the Feedback Hub is just as important as the telemetry that Microsoft collects. However, user feedback usually talks about the symptoms that tell them that an issue or problem exists. Fortunately, telemetry helps document (or at least point to) causes, problems, or events that help to diagnose such things. Thus, telemetry often leads developers to possible solutions, fixes, or workarounds. Among other things, this means that turning telemetry off in Windows simply deprives Microsoft of the data it needs to find and fix problems. I’m pretty sure the company doesn’t care about this data except in the aggregate. Thus, those who choose to turn telemetry off — as is their inalienable right — must recognize that they’re also limiting the chances that MS will find and fix problems that bedevil their PCs. That’s because the company prioritizes faults and issues to fix by the numbers. When telemetry is turned off, those PCs cannot add to those numbers, and reduces the counts that drive fault and issues prioritization. One feedback report per individual problem or item, please. Different problems or items go to different groups on the Windows team. Thus, keeping them separated makes such reports easier to route and track. Who knows? You may even get an email from MS that tells you a bug or issue you reported is fixed!